This simple leather slip collar is thin and strong. Designed to sit high on the neck and fit snugly, it has a snap so it clips on to the dog’s neck. 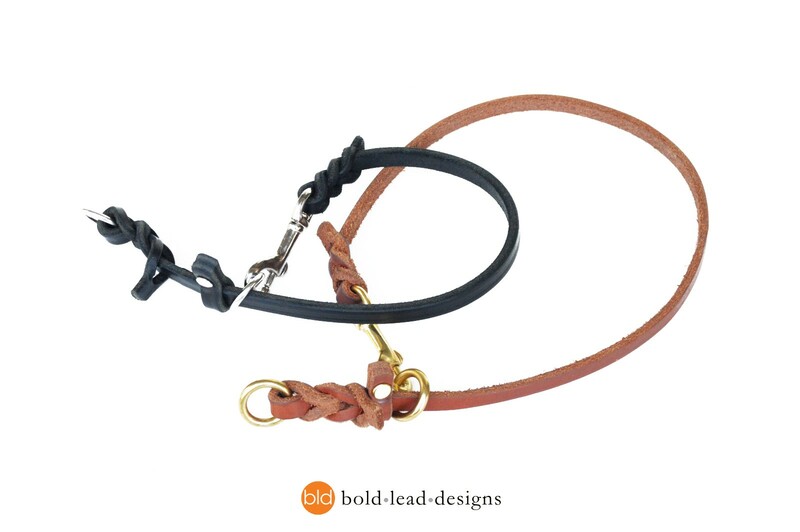 We include an adjustment fob to keep it snugly fit to your dog’s neck. Narrow 3/8″ wide leather is thick and sturdy. The beveled on the edges give it an almost oval shape to be gentle on your dog’s coat (similar to rolled leather, but more flexible). Makes a nice show collar for larger breeds too! Made to order! Allow 5-7 business days for creation. The Slip/Training collar has a small bolt snap, loose ring and fixed ring at the end to snap your leash to. We’ve included an adjustment fob for a perfect fit, even after the leather stretches a bit from normal use. Handcrafted with our famous leather and the highest quality hardware. 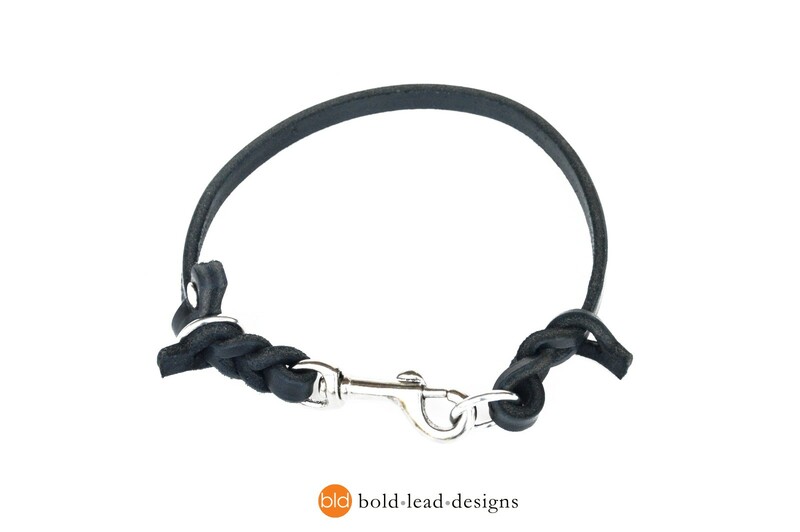 We hand braid these collars; there are no rivets or stitching that can wear out or come undone. Made to order! Size for this collar is measured from the snap to the loose-ring. See diagram. Do NOT add extra length, but if in doubt, order the next size larger. Remember there is an adjustment fob to make the size smaller. 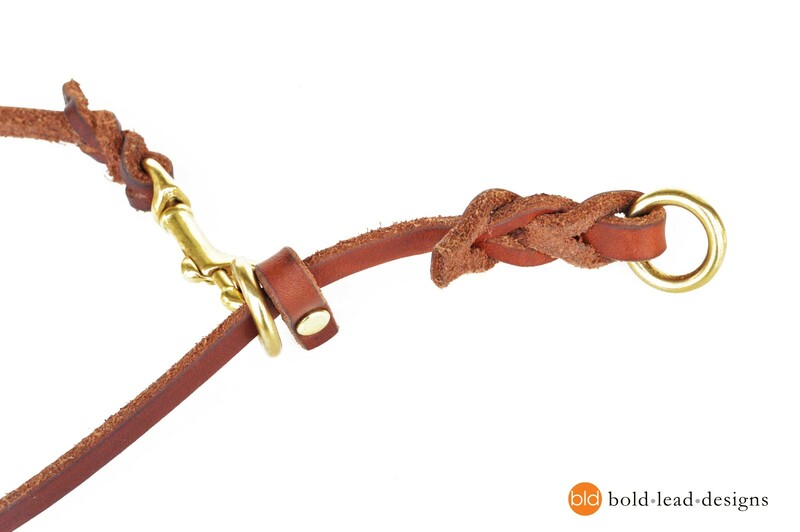 Our Golden TAN BRIDLE Leather is 100% American vegetable tanned leather, made with NO dyes or toxic metallic chemicals. 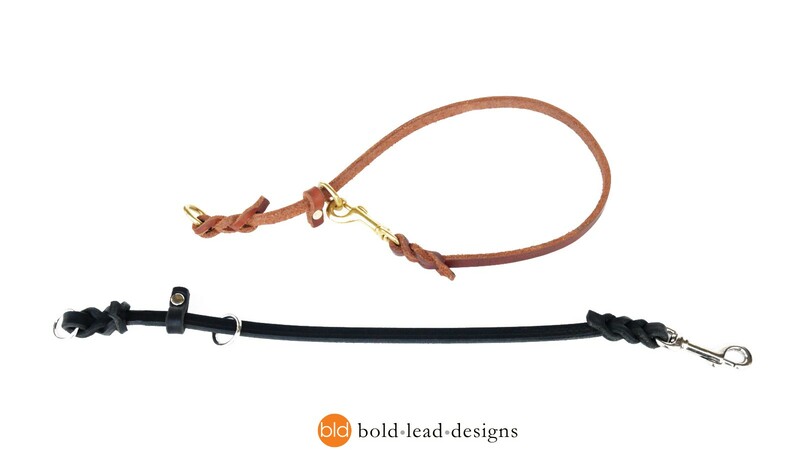 Reminiscent of fine English horse tack, this leather is superior in quality to any other leash you’ve seen. 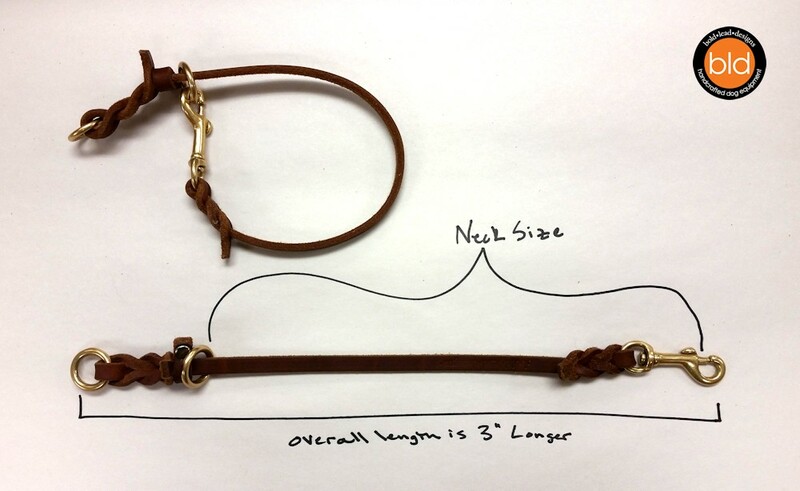 Every leash is HAND-OILED to bring out the softness. The color will darken with use and age. Solid brass bolt and solid brass o-rings. NOTE: solid brass may tarnish and rub off on light colored / white dogs. Our lovely BLACK LATIGO is solid black, and superior to ordinary leashes in texture and quality, cut from select from USA hides. It is incredibly durable, yet is very flexible. Feels great in your hands and will simply get better with age. Stainless steel bolt snap and o-rings. Not recommended as an everyday collar. Do not allow dog to be unsupervised with the collar in the slip/choke collar position. Note: brass hardware can stain white/light coated dogs; the oil in dogs’ coats can create tarnish, a harmless chemical reaction. This is a brilliant quality tag/slip collar. I have the tan and brass version and it suits my red heeler beautifully. It was a little stiff when it arrived which is to be expected from new leather so I rubbed it down with a little coconut oil, working it over a wooden dowel to make it soft and supple. Even sitting loosely at the base of her neck the collar hasn’t come off yet – it nestles neatly into her fur and a quick rub smooths the fur back to normal when I take it off her. Changing it to the slip ring makes it the perfect backup for her training collar. I will be buying another collar for my German shepherd when she reaches her adult size. I absolutely love this collar. It’s the only collar I’ve found that doesn’t break my Golden Retriever’s fur, nor wear down a distinctive “ring” around his neck. The only reason I give it four, rather than five, stars is because after about six months of use as a daily-wear, ID-tag collar and intermittent wear in a limited-slip configuration, this collar stretched from its original 16″ to 20″. This made its limited-slip configuration nearly useless. My dog is fine walking on a flat collar; the limited-slip is used more for my own peace-of-mind than anything. Since my dog can easily slip almost any collar he’s ever won, it was really exciting to find a collar that could be worn both as a flat and limited-slip collar. The quality of the leather is among the absolute finest I’ve ever found in well over a decade of evaluating and handling both pet and working dog gear. It’s the best collar I’ve ever found for a double-coated breed, especially my dog who is quite sensitive to what he wears. Nylon collars cause quite him a bit of itching, no matter how loose, and leather-and-chain martingale collars tend to break his fur. I’d completely recommend this collar to anyone. I don’t know how or why our particular collar stretched this much, but I did contact the company. I received a kind, very courteous reply from someone who doesn’t work with the leather, but let me know she would be speaking with someone who does within the next day or two and either that person or she would be in touch. I never heard back after that. Despite that, I may even go ahead and order yet another of these collars for my dog to simply wear as a tag/ID-only collar. I do wish I would have the option of the limited-slip configuration, but even if I have to purchase a second collar to be certain my boy cannot slip his collar in an emergency, it’s worth it to me to have one of these very high-quality, comfortable, soft collars for him to wear daily. It’s absolutely unique in its quality construction and comfort for my dog, which is what comes first, above anything else. Great “everyday” collar for dogs with thicker coats! I have a Pembroke Corgi and most flat collars disrupt/crease her ruff if worn regularly. I love that this collar preserves her coat with its relaxed, low-profile fit when clipped to the end ring, but I can set it up as a high-fitting slip collar for potty breaks or when I need more control. The tan & bass looks super classy on her red & white coat. Its breaking in very nicely and feels very durable. I brought this collar about 3 months ago as an easy on-off all purpose collar for tags. This collar doesn’t crease my dog’s fur which is important since we’re active in the conformation ring. I leave it clipped on the ‘dead’ ring. Super quality and will be back for many more items. Elegant simplicity, beautifully made. I opted for the tan bridle leather with brass lobster clasp and the matching 8 way leash and feel that I have a set for all purposes.